I started researching Z pellet grills to see if they should be included on my list of The Best Pellet Grills for the Money and am tempted to add them. Before that happens I would like to see a little more data on real world performance and customer service. I have been using the 700 square inch Z pellet grill for several months now and I have to admit that I love the thing. 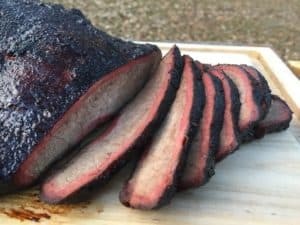 I am going to keep the original overview I wrote on these smokers posted just for reference but I have learned a lot about these products since this article was first published. Based on an assembly video on YouTube I thought these grills were clones of the Pit Boss smokers. That was incorrect. These grills are straight up Traeger clones. These grills are made by the same Chinese factory that made Traeger’s for several years. I grabbed this screenshot off of the Z grill website a while back but it has since been taken down. Traeger’s are fine products with a fanatical fan base. I have always thought that they were a little too expensive for what you got. Z grill has fixed that problem. These grills do NOT have the open flame broiler that is shown in the picture I posted in the original review. The grease tray is a simple slanted piece of steel just like you get on a Traeger and keeping it clean it easy. The maximum temperature I have been able to reach with my grill is about 410F. You will not be searing steaks with one of these but you will be able to get crispy chicken skin. The temperature control is pretty good on my unit. It takes about 30 minutes to stabilize at a target temperature and once there it will bounce around by about 10 degrees but it always comes back home. I have put over 100 pounds of pellets through my grill and have not had any issues. It has been a joy to use. I have no idea how long this grill will last but it does come with a three year warranty which is as good as what you get with a Camp Chef pellet smoker. That’s it for the update. The original review is below. The most information I could find about the company comes from what was posted on their IndieGoGo campaign which raised almost half a million dollars in funding from 1,404 backers. ZGrills was started when “An Idea Was Born” in September, 2016. The idea was to build a high quality pellet grill at the absolutely lowest cost possible. They wanted to make pellet grills affordable for everyone. By February of 2017 they have finished their final prototype and launched their IndieGoGo campaign the following month. 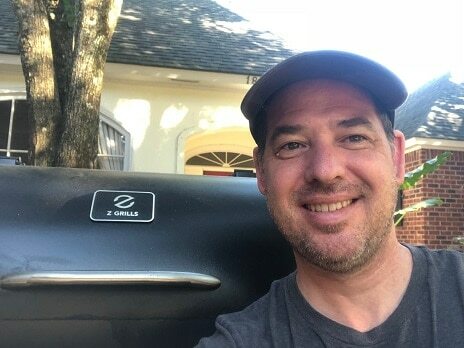 In July of 2017 they started shipments of their first grill, the Elite 900. The Elite 900 had 456 square inches of grilling space partnered with a 129 square inch warming rack. The grill came with a three year warranty and cost the initial backers $339. The face of the company (200+ people) is Jasper Yu from Burlingame, California. Z Grills markets themselves as a “Proud American Brand” that manufacture their products in China. Z Grills is the natural evolution of global trade. I think that they are a Chinese factory that has been making pellet grills for American companies for years. They finally made the logical decision to skip the middle man and start selling directly to US customers. They have 50 years of experience with stainless steel production. This is NOT an outfit that was born from an idea in 2016. 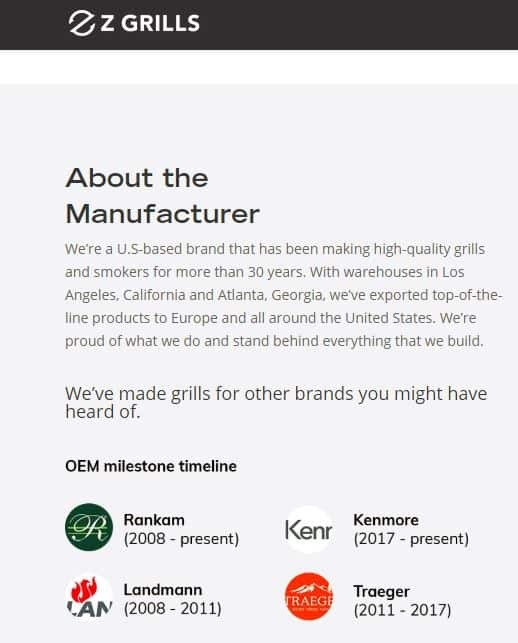 While Z Grills might be a “Proud American Brand” all of the marketing, website information, etc has the poor grammar, misspellings and awkward phrasings used by Chinese companies trying to sound American. I copied this little gem from the FAQ section of their website. How many cooking sessions do you get per bag of pellets? The amount is based on cooking time and temperature. Most long cooking time is usually at lower temperatures. Kind of makes me think they have never cooked a slab of ribs before 🙂 Ah, heck….I am just being picky. Maybe smoking ribs for 14-16 hours is something I ought to try. It does not bother me that this looks like a Chinese factory selling direct to US customers. This is a smart idea on their behalf and will challenge US companies to actually provide real value instead of glossy marketing campaigns. It has been difficult to get much real information on the actual grills. It looks like they have a small grill with two different names and a larger grill with two different names. The small grill is called the Elite 900 and the ZPG 450. This grill has a 15 pound pellet hopper and a 330 square inch primary cooking grate and a 120 square inch warming grate. The larger grill is either the Pro 7002 or the Masters 700D. This grill has a 20 pound pellet hopper, a 513 square inch primary cooking surface and a 187 square inch warming rack. 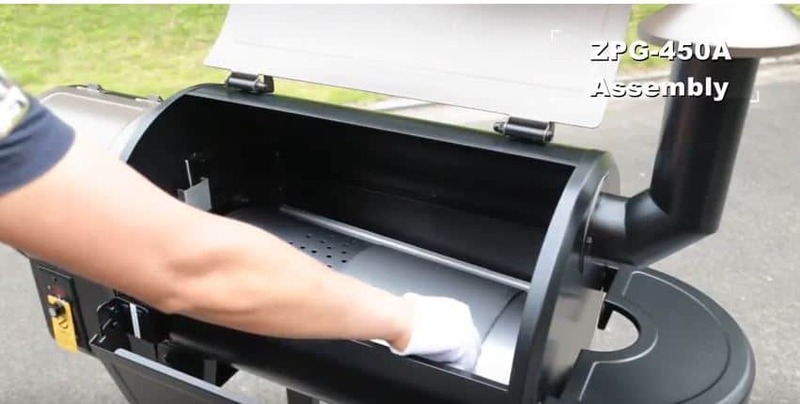 I watched the assembly instructions for the ZPG 450 and it looks like Z grills have a version of the Flame Broiler system used by Pit Boss. The two sources of reviews I looked at were Amazon and Indiegogo. The reviews on Amazon are not really useful. While there are a LOT of five star reviews from verified customers many of them look “planted”. Follow up questions on Indiegogo are mixed. Some folks love their grill while a lot of people are having problems with the temperature controller. It looks like Z Grill may have had a bad batch of control boards and are doing their best to get them replaced. 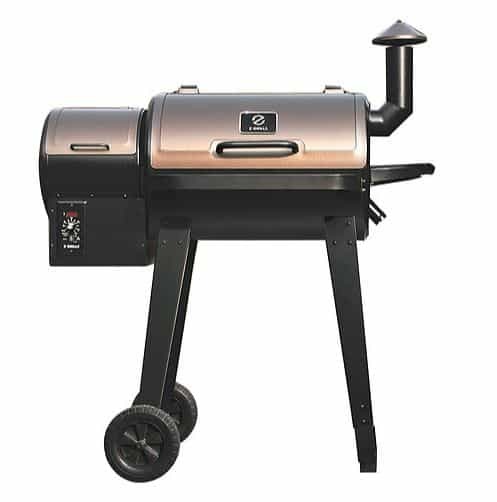 The Z Grill products are priced equivalently to Pit Boss and come with a three year warranty. The Pit Boss grills come with a one year warranty. 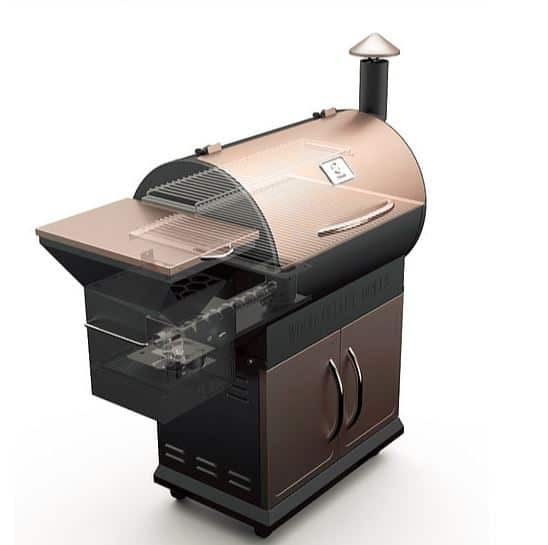 Both Pit Boss and Z Grills are priced hundreds lower than the equivalent Traeger counterparts. The temperature control system on the Z Grill looks identical to the one on Pit Boss products. It is too early to tell if these grills are a good value or not. I would love to hear from folks that have owned theirs for a while and who are willing to provide feedback. I received a 702B for a Xmas present(2018). After trying 2 control panels, the max temp I could reach was around 385 and lower temps would not maintain. This grill came from Amazon. I just purchased the same grill from Home Depot. Max temp is still around 385, but lower temps maintain much better. I think it is false advertising that they say it can reach 450. Thanks for sharing your experience! A lot of times pellet grills will struggle to hit top temps in the winter. Traeger actually sells a thermal blanket for their models to help with this. Just curious….How cold/windy is it when you are trying to max out the temperature? Am an avid charcoal person. Always have a hard time maintain a consistent temp for long period smoking, so I start my meat in the oven and finish it on the grill. This is one reason I was thinking about a electric pellet Smoker. The price is rite but I have a concern about the electrical part. Can I use a heavy duty extension cord to it> If so what type of extension cord. and how long of one. Another thing I think about, is using pellets, can you use and not get a smoky flavor. Scott, I use a standard heavy duty outdoor extension cord for my pellet grill that is about 25 feet long. The degree of “smokey flavor” is typically less than you get with charcoal. My grill is awesome at any temp under 275 after that it runs away so hot that it has burned the finish of the front of my grill. I’ve written to customer service waiting to see how they respond to this. For now I have to just put it away for safety concerns.